The smell in this wasn't as strong as the chocolate one but you can still catch a whiff of strawberries. I've read about people complaining about the strong scent in the original version so maybe they toned it down? 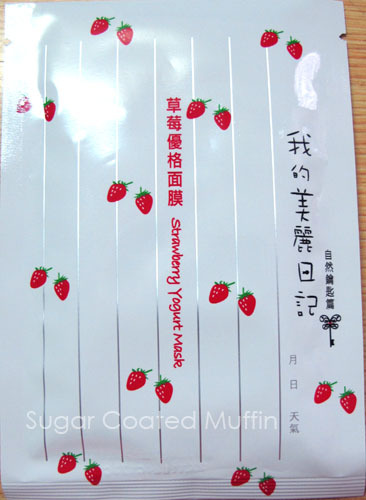 Even the MJ Strawberry Souffle mask had a stronger strawberry smell. Despite having 3 layers (moisture component between 2 sheets), the mask is much thinner than the original one. 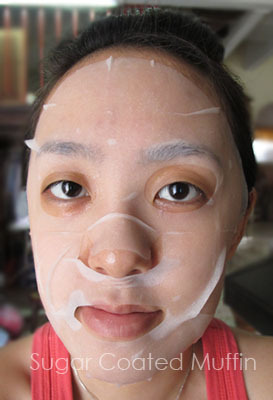 It's like the Purederm mask, so thin and partially see through like popiah skin. I especially love masks with thin sheets so this is a big plus point! Don't assume that thin = less essence cos this was very moist! I can actually say that it held more essence than the old thick sheet. This mask is for oil control and repairing but I don't think I'll be able to see the repairing effects. As usual, skin feels soft and smooth after. Can't stop touching my face =_= I didn't mind leaving the essence in as it wasn't sticky. Regarding oil control, this definitely didn't work immediately. Face still became oily after a few hours. Maybe it will improve with regular usage? My conclusion : Love the new upgraded version! It's so much more moisturizing then the original one and the thin sheet is just awesome. Can't wait to try the others!